Under the motto “be smart”, WITTMANN BATTENFELD will present, among others, two machines from its PowerSeries in the COMBIMOULD version at the K 2016 in Düsseldorf from 19 to 26 October in hall 16, booth D22. With the completion of the 2C versions of the MicroPower and the SmartPower, multi-component technology is now available for all machines of the PowerSeries. The MicroPower 15/10H/10H, the first two-component machine of the all-electric MicroPower series designed for injection molding of small and micro parts, is one of the highlights at the WITTMANN BATTENFELD booth. 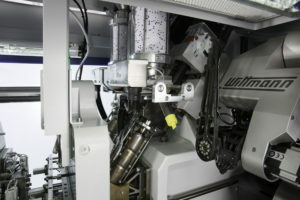 This machine, shown for the first time at the 40th anniversary of the WITTMANN Group, is the only stand-alone multi-component machine in the micro segment currently on the market. This 15-ton machine, equipped with two horizontal injection units and a rotary disk, can be used for either single-component or two-component injection molding. This makes it possible to mold parts in different colors and/or made of different materials and/or produce two different parts simultaneously in one cycle, with two ejectors handling parallel ejection of the parts in the latter case. When using the machine for multi-component injection molding, the integrated rotary disk takes care of transporting the part to the second injection unit and back. Insertion and insert molding of parts can also be realized very comfortably with the COMBIMOULD version of the MicroPower. In addition to injection molding of parts from different thermoplastic materials and/or in different colors, the MicroPower multi-component machine also lends itself to liquid silicone injection molding or metal/ceramic powder injection molding. 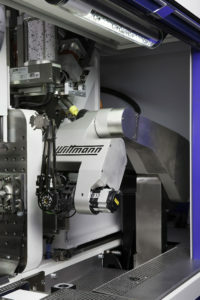 For the MicroPower COMBIMOULD version, the Scara robot specially developed by WITTMANN for the machines of the MicroPower series and completely integrated in the machine has been fitted with an additional pivoting axis. The dimensions of the integrated TEMPRO Micro dryer designed for these machines have also been adjusted to this model. As is possible with the standard MicroPower, two temperature controllers can be installed inside the MicroPower multi-component model as well. The multi-component MicroPower machine is laid out for clean room injection molding. The machine’s rotary disk is completely encapsulated. All connections for heating, temperature sensors, water temperature control, the pneumatic core pull system, pneumatic sensors and blow through valve are mounted on the rotary disk. 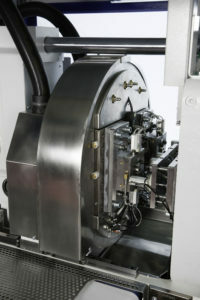 The resulting short connection lines to the mold enhance the machine’s user-friendliness. As with the standard machine, the injection units of the multi-component MicroPower also come in the form of two-step screw-and-plunger aggregates with a shot volume of 4 cm³, which, thanks to their minimal flow paths, enable processing of thermally homogeneous melt and consequently excellent parts quality. The MicroPower COMBIMOULD machine stands for ultimate precision, repeatability and cost efficiency. From the 2nd quarter of 2017, the MicroPower COMBIMOULD machine will be available with the new UNILOG B8 control system. At the K 2016, WITTMANN BATTENFELD will demonstrate the functionality of this machine by manufacturing a 2-component plug for the sound carrier head of a vinyl record player made of PC and conductive PC with a single-cavity mold supplied by Ortofon, Denmark. The conductive PC features an extremely low conductivity resistance, which ensures excellent signal transmission. The machine is equipped with an integrated camera system and a WITTMANN W8VS4 Scara robot for fully automatic quality inspection and parts removal. At present, Ortofon injection-molds the PC plastic part and manually inserts the conductive part, which currently still consists of metal. With the WITTMANN BATTENFELD COMBIMOULD process, the company will be able to replace the manual work on these parts by fully automatic machine manufacturing and thus achieve a substantial cost cut. True to the motto “be smart”, WITTMANN BATTENFELD will present for the first time at the K 2016 the Combimould process on a machine from the servo-hydraulic SmartPower series. The SmartPower machines are currently available from 25 to 350 t as standard models and will be available with multi-component technology as well from K 2016 onwards. It thus replaces the hydraulic machines of the HM series from WITTMANN BATTENFELD supplied so far with clamping forces of up to 3500 kN. Larger COMBIMOULD models with up to 16,000 kN clamping force have already been supplied as part of the MacroPower series of large machines since K 2013.